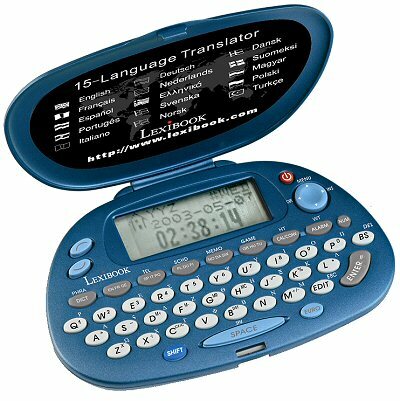 15 Language Pocket Translator - the ideal travel companion! The Lexibook NTL1560 is a state-of-the-art pocket electronic dictionary that translates between 15 European languages English, German, French, Spanish, Italian, Portuguese, Polish, Dutch, Swedish, Finnish, Danish, Hungarian, Norwegian, Greek, Turkish - making this an ideal companion for anyone with an interest in foreign languages, or for those travelling, living or working in Europe. This pocket translator boasts over ONE MILLION quality translations elaborated by European linguists, which is more than enough to cope with almost all situations in which you will find yourself. In addition, each language is complimented with 10 categories of commonly needed phrases, including: business, restaurant, hotel, city, travel, emergency, leisure, bank, post office, telephone, airport and general. Best of all about this translator is its simplicity (switch on and go), dictionary quality and very reasonable price.